The people came, they ate, and they revealed their favourite fish and chip shops in New Zealand. Kiwis flocked to social media to discuss the staple Kiwi meal, unearthing some hidden gems and locally famous chippies from around the country. From Dunedin and Christchurch and across to the East Coast and Auckland, we take a look at your favourite fish and chip shops. Rated 4.9/5 on Facebook, Devon Seafoods has fans from around the globe including Canada, England and Australia. Their fish is fresh, light and crispy and is the go-to chippie in Rotorua. The delicious takeaway store is also known for its customary extra piece of fish they throw in for every family meal order, making it a favourite among the locals. Known as the most popular fish and chip shop in Tauranga, you often have a lengthy wait but locals and tourists will tell you it's worth it every time. Bobby's sits on the wharf overlooking the sea, providing a brilliant backdrop to munch down on the freshest fish in town. The batter is crispy and chips crunchy on the outside and soft on the inside. At Bobby's you can have your fish wrapped in ice to take home or battered on the spot. As one local puts it: "Good fish and chips and reasonable price, was worth the wait and sitting on the wharf in the winter sun eating takeaways with the scream of seagulls ... well how Kiwi is that." This place is famous in the South, with owners Mei Yee Lu and Thanh Bang Lu helping students cure their hangovers for years! A few years ago they were known to give out free Captain Ben's caps to people on drunk adventures but demand got out of control. Their chicken burger is a favourite among regulars and they've even morphed KFC's double down into their own delicacy. RELATED: So here's why ready salted chips are called READY salted! Captain Ben's is located in Ilam, near the university, making it the chippie students swear by. While their chicken burger is ace, their fish and chips have been described as "really f***ing good". "Worth the drive" and "you have to eat here" tells you all you need to know about the tiny fish and chip shop that is located east of the Hunua Ranges and on the waterfront of the Firth of Thames. They guarantee 100 grams or more of fish fillet in every fish order and it comes wrapped in the old school newspaper print. Choice! If you like crispy batter you're in luck, with one reviewer saying: "they even gave you all the crunchy bits of batter from the chips, fish cooked to perfection". Definitely one to tick off the bucket list. Rated 4.8/5 on Facebook, The Flying Squid based in North Dunedin is considered by many to be the most amazing fish and chip shop in Dunedin. Customers have called their blue cod the best in the South Island and they cater for those who are gluten intolerant. Locals flock for their $2 shoestring fries with the option of garlic salt. One tourist from England believe it was "easily amongst the best fish n chips" he'd ever had. "I'm a well travelled Brit with a bit of a thing for a good chippie." Fish Smith was ranked in Metro's top 5 best fish and chips in Auckland for 2018. Owners Thomas Ng and wife Lilian Sng hand pick their fresh fish at the markets and offer the option of battered or crumbled fish. 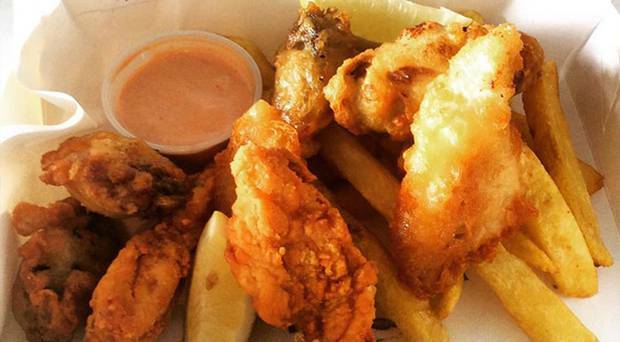 "This is the best local fish and chip shop I've found in 10 years of living in Auckland." Greenwoods was ranked in Metro's top five fish and chip shops for 2018.